It’s that time of year again, time for our Christmas Gift Guide! Each year I try and buy as much as I can from independent UK businesses. I absolutely love shopping with smaller companies because every purchase means so much to them. So what will you be buying your dogs this year, or a dog themed gift for a friend or family member who just loves dogs as well? Well we’ve got a gift guide full of products I just LOVE, so hopefully there’s a few gift ideas in there for you. Country & Twee is an independent British company who design and sell practical, yet stylish coats and other dog accessories. Their standard coats are suitable for the majority of dogs. They also have a Breed Specific range, for dogs with unique confirmation. These coats have more tailoring involved to get the best fit possible. Their current line for Breed Specific dogs includes, Dachshund’s, Whippets, Lurcher’s, Greyhound’s, French Bulldog’s and Pugs. First up we’ve got their coats to show you. Wilma is wearing their ‘Black Dog Coat’ which is the smartest dog coat I think I’ve ever seen. If a Dog had a Sunday best, this would be it! She just needs to off to Church in it, and she’ll be the best dressed dog. The underneath is lined with Sherpa fleece which is so soft, if only I could have a matching human coat! This coat in Wilma’s size 16″ is £53.50. Woody is the proper Country Spaniel in their ‘Tweed Dog Coat’. Looking dapper this is the perfect coat to keep him warm and cosy when exploring a Cotswold town. Both these coats are such good quality, and although I think you may appreciate it more than them, it’s the perfect gift to wrap up and put under the tree. This coat in Woody’s size 20″ is £53.50. Unlike other brands, Country and Twee actually cater for dogs of all sizes! They cater for all breeds from Chihuahua’s to Rhodesian Ridgebacks and everything in between, which is so important if you’ve got a real mixture of dogs & you can shop in one place. They don’t just sell dog coats, another of their products is the Tweed Dog Bed. Wilma wouldn’t even let me put the bed on the ground before she’d hopped in. She loves a good bed to snuggle in, so this will definitely be on her Christmas list. It’s a great size for both the dogs to curl up together [something that I often walk in on them asleep together]. This bed in a size large is £105. You’ll have seen how much I love the Inspired By Darcy range if you’ve read our blog post all about it here. But we have a brand new product to show you! A breed personalised China Dog Treat Jar. Like their other products you can choose between the colours of Spaniels or Labradors that you’d like on the jar. Obviously we have the beautiful brown Spaniel edition & it fits just perfectly with the rest of our collection. Each evening and any other time I leave the dogs in their beds, they get a bedtime biscuit. So this jar is great to store them all in.When ordering you also get one FREE box of Lily’s Kitchen treats, of which you can choose the flavour, so which one will your dogs go for? This jar is £25. Something a bit more festive is their China bauble, again with the colour and breed you choose. This will look excellent on your Christmas tree, just remember to hang it up high so it is safe from any wagging tails. This bauble is £19. This is a company I’ve been following on social media for some time, and have absolutely loved each product so I can’t believe I’ve not dressed the dogs in it yet. I love the excuse to dress my dogs up in anything festive for the lead up to Christmas, so this Winter range is great for their December adventures. But this ‘Winterberry’ set isn’t only limited to the Christmas month, it looks great on your dogs all winter long. We have the collars with a Bow tie, Bandana & Flower that can be added on as accessories. With Bow ties I think bigger is better to make your dogs stand out and look fabulous. For an approximate spaniel size these are the prices – Collars £11.50, Bow £9.50, Bandana £8.50 & Flower £8.50 but they’re all available in smaller sizes for different breeds. If you need even more Christmas in your life, then there’s some more fantastic Christmas prints for sale on their website here [I think Jolly Blue is my favourite!]. Even better – If people spend £20 or more on their website between now and Christmas they will receive a free gift! I discovered this brand earlier this year, and I absolutely love it! Keri hand makes these natural grooming products. It made me think why use chemicals on our dogs coats when there’s this fantastic alternative that is good for them & a whole lot better for the environment. As well as a whole range of products you can purchase at any time, in this gift guide we’re focusing on her gift boxes. There are a few variations and these are a great gift for your dogs, a friend with dogs or maybe even to your dog walker or groomer to say thank you, but also giving them the chance to learn about new products. For those Fluffy and Curly coated dogs there’s the ‘Curly Coat Care Kit’ this contains Conditioning Shampoo and a Tame Those Tangles detangler. Plus a 15ml Nose, Skin and Paw balm and a shower scrunchy to make dog bath time much easier and economical. I’ve heard of so many other Doodle owners using detanglers so I was so excited to use this and it didn’t disappoint. For Spaniels or any other shorter coated breeds then the ‘Classic Canine Spa Kit’ is just what you need. This contains a full size Conditioning Shampoo, A 100g dog soap in either lavender or Lemongrass/Mint , a 15g tin of both our Nose, Skin & Paw balm & plus a shower shammy. The dog soaps are my favourite product of Keri’s and they smell divine! They do a brilliant job at cleaning the dogs and last forever. Then for dogs that have dry noses or pads on their feet the balm is great to rub in. These boxes are both £24.99 and well worth their value. A gift for the humans is these Oilcloth aprons, ideal for dog grooming or washing the dog. We recently blogged about them here. You could have them personalised with that persons name, or their dogs and its a great gift they will actually be able to use. If they’re not totally dog mad then they can also use them in the Kitchen whilst cooking the Christmas meal. They start at £16.95. Maddie’s is a small business that hand makes these delicious dog treats, which are baked to order from their Kitchen in Staffordshire. For Christmas this year they have a selection box for sale. 1 x bag of 5 large Honey and Ginger / or Peanut Butter and Banana ‘Christmas Tree’ biscuits, with carob coated ‘tree trunk’ and dusted with ‘snow’. 1 x bag of 12 Mint and Parsley Christmas Stars. 1 x bag of 12 Christmas ‘Chocolates’, made of organic carob powder and extra virgin coconut oil. I love the festive shapes of the biscuits, these are great gifts for your friends at dog training, or a good neighbour for a festive treat for their dogs. Maybe not one to wrap up and leave under the tree though, as they might not be there when you get home! These boxes are only £10. You know I just LOVE personalisation; Hoobynoo have a whole range of products custom to your dog breed. Woody received a personalised Christmas sack which you can choose the Name, breed and dogs colour to have printed on the front as well as who the presents are from [Mum and Dad or Father Christmas etc] and it’s too cute! This is going to look perfect under the Christmas tree for him to keep his paws crossed to hope that Father Christmas fills it up. A small sack is £23. For Wilma, she has a personalised Christmas tree decoration, with an illustration of her cute fluffy face. Like the sack, the bauble can have name and breed added and it’s a great idea to have one for each of your dogs on the tree this year. This decoration is £12. 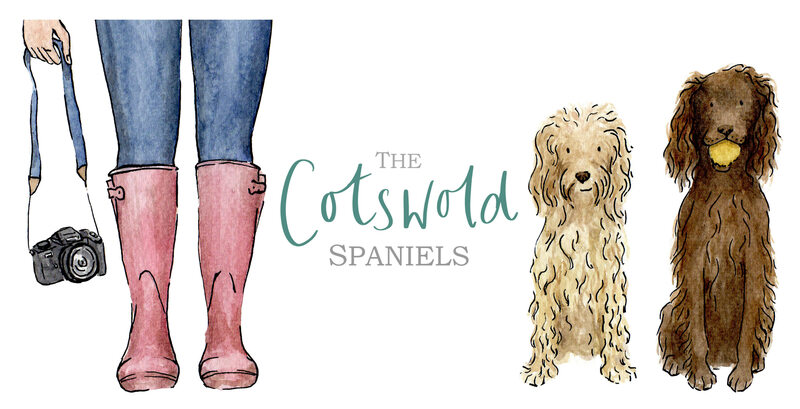 Having switched the dogs over onto a RAW diet with Cotswold Raw earlier this year I’ve been much more aware of what my dogs eat and making sure they’re as healthy as can be. So I go to Harleys Hounds for all my chews, they post out large bags of each chew type you’d like. But if you’d like a selection to try out different chews or just a variety for your dogs then their new treat boxes are ideal. It includes 2 Cows ears, 2 pieces of dried Tripe, 6 mixed Rabbit ears – with and without fur, 4 Chickens feet, Beef head skin and 2 pig noses. All that for just £12.95 with free postage. They don’t have an online shop but you just message them on Facebook or their Instagram to place your order. You’ll have seen in last years Christmas gift guide I featured the wonderful Crazy dog lady tags which can be personalised with hearts for each of your dogs/family members. I’m running out of people to give these to because I buy them every year as gifts, so this year we’ve got something new to show you. This time an ID tag for you dogs collars, but a festive themed tag! The ‘Santa’s Little Helper’ tag is minimalistic but the cutest festive message. If your dogs were to get lost then all the important information is engraved on the back. Then on the front is the Santa’s little helper saying. This just makes me want to dress them up in little Elf outfits. This tag is £13.99. If you didn’t know I am a Photographer, specialising in Canine photography. This Christmas I have a special offer on my photoshoot vouchers. Why not give someone the special gift of memories this Christmas; photos they can treasure forever. For £80 they receive a photoshoot voucher for a shoot with me in the Gloucestershire / Cotswolds region at a location we decide together. But not only will we have a fun filled photoshoot, of which they’ll receive a password protected gallery to download all the watermarked images from the shoot. But with my Christmas special offer they’ll also receive a £15 print credit voucher which they can put towards beautiful prints and products of their favourite images. Just email me here for more information. That is our Christmas Gift Guide 2018, thank you for reading all the way to the end! If you can try and shop with small businesses this year. Remember to order in plenty of time to make sure they can process your order. Lot’s of these companies have small teams so need time to make all the orders as well as taking time to enjoy Christmas themselves. Such a great guide, thank you so much!